Andrew McAuley, a member of the NSW Sea Kayak Club, is missing off the Fiordland coast of New Zealand. This is a dire situation for his family and friends, the Club, and also for the sea kayaking community in Australia and overseas. Andrew has been a fantastic ambassador for sea kayaking, having been recognized as the Australian Geographic Adventurer of the Year in 2005. He's a person who has proved his ability in extreme circumstances. He's inspired many kayakers and is a well known and well respected member of our community. 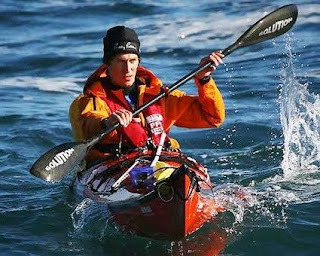 In all of Andrew's expeditions, he has been at the forefront of exploring the limits of both himself and the sea kayak. He always puts enormous effort into planning his trips, designing purpose-built equipment and testing both himself and the gear. Yet he is pitted against the sea. Andrew knew the risks and prepared accordingly. His trans-Tasman expedition has shifted the boundaries of what's been done by sea kayakers. It's just such a tragedy that having made the solo journey of over 1,500km that he met with misfortune less that 100km off the New Zealand coast. The New South Wales Sea kayak Club has set up a support fund for Vicki & Finlay.